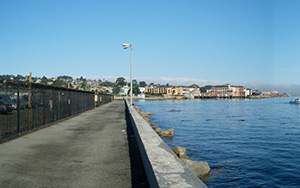 Another diver lost his life in Monterey last Saturday. This time it was a 65 year old Alameda man who’d “recently gotten back into diving.” According to the story, he and his diving buddy had begun to surface when he simply disappeared. Shorty afterward the search was on and his body recovered about 30 minutes. Autopsy results ruled out a heart attack. I have no additional information, but my guess is that inexperience played a major role in this tragic accident. The safety record in diving is exceptionally good. As a whole, the diving industry is incredibly safety-conscious and the level of available training, technology, etc. rises everyday. What the industry can’t control is the individual. Often, we deal with individuals who haven’t been diving for some time. Perhaps someone was an avid diver in the 70’s, but work, family and other pursuits interrupted his or her diving activities. Now retired, that person decides to get back into the water, relying on expertise and a fitness level remembered from a bygone era. There is no reason a person can’t return to diving after many years. In fact, I encourage it whole-heartedly, but please don’t expect to jump in a swim you did when you were in your 20’s. Get some up to date training. Have your equipment inspected, or better, simply replace it. And, hire a professional to serve as a guide and to bring you up to speed on current safety practices and procedures. I often say that, as long as everything goes well, diving is a pretty easy activity. Inhale, exhale, repeat. It is impossible to say how many dives should be supervised before going it alone. For some, a simple refresher course is enough. For others, maybe not. The point is, diving is deceptively simple. For all I know, none of this applies to this diver. He could have been a shining example of fitness and presence of mind and this was just a freak, random event. Statistically speaking, that’s probably not the case. The water off Monterey can be pretty rough. At the very least, it will be cold and the visibility somewhat limited. Every diver must consider his or her experience level and personal ability to deal with issues underwater or on the surface (and level of fitness, please). My heart goes out to the family and friends of this man. He no doubt left people behind who loved him and will miss him dearly. This entry was posted in Dive Sites, Diving News, Diving Safety and tagged diving accidents, diving safety.